Bedford Town celebrate: Picture: June Essex. Bedford Town’s FA Cup hopes were ended when county rivals AFC Dunstable left the Eyrie 2-1 winners in the Preliminary Round on Saturday. It was the first time the visitors had entered the competition and they took the lead on nine minutes when, from a Jermaine Hall corner, McGhan-George rose the highest to head home. With the visitors playing some neat football, they created another good chance with a fine move that resulted in Hall shooting just wide. AFC almost added a second as BJ Christie broke clear only to shoot well wide. Bedford made three substitions at the break to add urgency to their performance. They started to get a stranglehold on the game and should have drawn level on the hour as a defence-splitting pass put in striker Lee Roach who somehow fired wide. They finally deservedly equalised when Josh Bamford was on hand to head into an empty net from a corner after 65 minutes. If anything it now looked if Bedford would progress into the next round, as confidence grew and the visitors began to look nervous. However with 14 minutes to go, Christie held the ball up superbly to tee up Hall who struck a left footed 20-yard drive into the bottom corner. 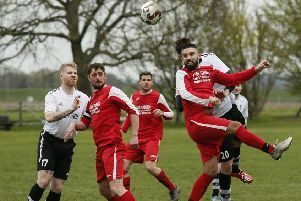 The Eagles went all out to force a replay but the AFC defence held firm to set up an away tie at Ryman League side Heybridge Swifts in the next round. Bedford Town now turn their attention to Southern League Division One Central matters. They visit Beaconsfield SYCOB on Saturday before hosting Bedfordshire neighbours Arlesey Town on Bank Holiday Monday at 3pm.